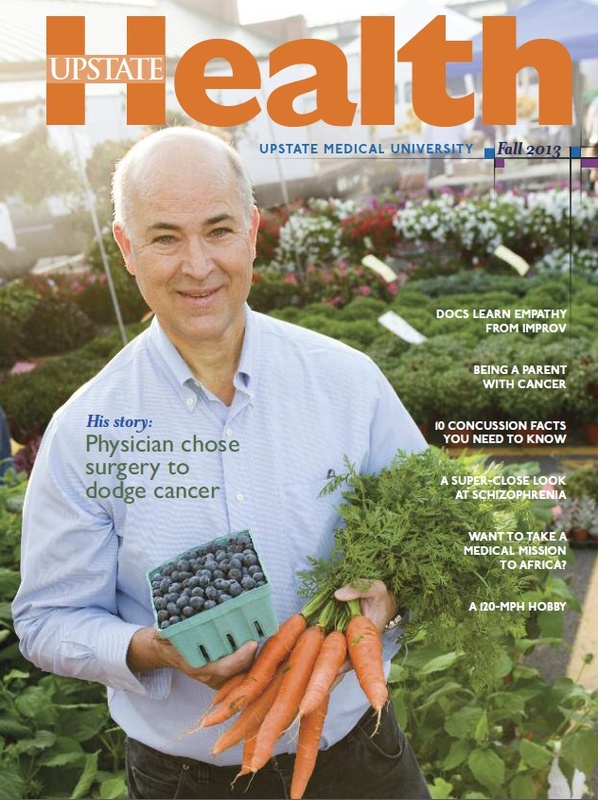 Welcome to Upstate Health, a magazine produced by Upstate Medical University to inspire healthy living. You will find stories about medical care and wellness, of course, but also a variety of articles that pertain to life in Central New York. Our experts share advice on caregiving, food and leisure activities in every issue. Scroll below, and click on any issue to view a full electronic version. Have you got a story idea? Want a free subscription, or extra copies for your office? Contact us at whatsup@upstate.edu or by calling 315-464-4836. Meet David Lehmann, MD, (on our cover) and Sunny Aslam, MD, (inside, page 19.) Read about how they are caring for the homeless population in Syracuse. This issue also contains stories from patients who underwent emergency heart surgery, stem cell treatment, back surgery and rehabilitation after a stroke. Plus, a patient shares how the pharmacy saved him more than $20,000, and a surgeon explains when the appendix should be removed — and when it should not. Our experts share advice on how to keep your home clean when someone is sick, what to know about depression after a stroke, the origins of five popular heart medications. We hope you enjoy this issue of Upstate Health magazine. Annette Adams-Brown goes to medical school — as a ‘standardized’ patient. Our story explains how you can, too. The standardized patient program contributes to the education of the next generation of doctors and other caregivers. Also in this issue, learn about aneurysm repair, strokes and a rare life-threatening infection known as Fournier’s gangrene. We compiled a story that shows the many ways Upstate providers are working toward solving the opioid epidemic. And, we tapped our experts for advice before buying a home genetic test kit. Thank you for reading Upstate Health. A team led by surgeon Moustafa Hassan, MD, helped save the life of Peter Corigliano, who appears on the cover of the summer 2018 Upstate Health magazine. Read about his experience starting on page 10. This issue contains several stories about people who have had strokes or been involved in stroke care, including a nurse who knew how to intervene at a local restaurant when she spotted someone with classic signs and symptoms. How many lives can be saved or enhanced through organ donations? One weekend in April, the Upstate transplant team helped facilitate a dozen transplants from the donations from four people. See that story on page 4. And learn about a man who recovered from a severe infection, thanks to a extracorporeal membrane oxygenation, or ECMO. His story is on page 14. Are you prepared to save someone from a drug overdose? Upstate clinical toxicologist Wille Eggleston provides a how-to on page 15. We’ve also got a detailed look at some of the neuroscience research taking place at Upstate, on page 18, and a story about a physician who is giving back to his native country of Afghanistan, on page 20. And don’t forget to check out the back cover of Upstate Health for our popular “Science is Art is Science” feature, this time showcasing the work of cell and developmental biologists. Our spring 2018 cover features nurse Laurie Rupracht, who created a charity that brings volunteers to Ghana twice a year to help build community and provide health care. You can read the story of one volunteer who took the 10-day African mission trip this past fall. Readers will also get to know a small-town physician assistant, and a man drawn to physical therapy as a career after his father had a stroke. We hope you enjoy Upstate Health. A medically fragile/mentally strong pre-schooler enlivens the cover of the Upstate Health Winter 2018 edition. Meet Tracy Cornell and read about her family’s story on page 5. But first, on page 3, meet Ashley Brown, Ashley Brown and Ashley Brown — all three of whom work at Upstate. This issue features patient stories about people with juvenile arthritis, lymphoma and Meniere’s disease, along with stories about researchers who are exploring 1. how stem cell therapy may repair brain damage from stroke or Alzheimer’s, 2. how tiny bits of genetic material may open up new ways of understanding diseases and how the mind and body work, and 3. how to differentiate between a prostate cancer that will grow rapidly and one that will remain indolent. Experts from Upstate share advice on how to prepare for a colonoscopy, and also offer insight into the grieving process. Plus, page 19 provides instruction on a lifesaving skill for stopping serious bleeding that you hopefully will never need to use. We also provide a look at three trailblazing women doctors from Upstate who are showcased in a new book. Enjoy this issue of Upstate Health. Our Upstate Health Fall 2017 cover features a man who survived severe frostbite burns, George Myers, who shares his story of recovery. This issue also features two different stories about men who recovered from stroke, and another about a man who is doing well after a liver transplant. Read this issue to learn about a “spit test” that may help identify autism in children, how neurologists are extending the use of a clot-busting drug for strokes, the surgeries that can take place through the nose, why more young people are at risk for stroke, and what you can do about the public health crises of gun violence and drug addiction. We hope you enjoy this issue of Upstate Health magazine, brought to you by Upstate Medical University in Syracuse, N.Y.
Urologist Dmitriy Nikolavsky is on the cover of the summer 2017 Upstate Health magazine, and you’ll find his story on page 12. It’s about some exciting research he’s doing, for a new way to treat urethral strictures. Also in this issue of the magazine, you’ll find a fun look at the evolution of the stethoscope, a ubiquitous piece of medical equipment that is 200 years old. You’ll meet two women who were helped by the stroke specialists at Upstate even though they had their medical crises hundreds of miles away. And you’ll hear from a social worker from the Alzheimer’s Association of Central New York about five behaviors that are common in dementia. We hope these stories, and plenty more, will make your reading enjoyable. We took a quick photo of William Paolo, MD, in the emergency department of Upstate University Hospital for the cover of our spring issue. He’s one of three physicians who shared a story about a lesson learned from patients. This issue also features an amazing story about a college student who was brought back to life during a Syracuse University basketball game, with the help of some of Paolo’s emergency colleagues. You’ll also read about some brothers who are battling cystic fibrosis together, and a new mom and dad who decided to donate their baby’s cord blood at birth. The experts from the Upstate New York Poison Center have some precautions about medication interactions of importance to seniors. A pediatrician tells how much exercise kids need, a doctor of physical therapy tells the best ways to protect your bones, and a pediatric gastroenterologist takes us into his kitchen. Also, don’t miss page 16. That’s where a neurologist shares her tip for stifling a sneeze. Larry Deshaw of Clayton is on our cover for the winter 2017 issue with stroke specialist, Hesham Masoud, MD. A series of crucial decisions made quickly (including his wife dialing 911) saved Deshaw’s life when a blood clot lodged in his brain. Read the gripping story about how all the pieces of the region’s emergency response system fell into place on July 19 when Deshaw was stricken. This issue also provides a close look at eye development, research underway at Upstate. And, we take a look at the benefits of breastfeeding with a physician who specializes in breastfeeding medicine at Upstate. We also tap one of our infectious disease experts to go over the right way to wash your hands. We have an important warning about liquid nicotine, and an herb that just might be useful as an anti-stress therapy. We also take you through an interesting triage process underway at Upstate — of masterpiece paintings that are going through an art conservators’ condition survey. There’s much more in this issue of Upstate Health, which we hope you enjoy reading. Jody Adams is an Upstate nurse who responded to a Facebook plea for a kidney donation — by donating one of her healthy kidneys to a woman she’d never met. “Yes, she’s a stranger,” Adams explained to friends who questioned her plan to donate, “but this is somebody’s daughter, somebody’s mother.” Read all about her decision, starting on page 6 of the fall 2016 Upstate Health magazine. This issue also includes the story of the first two patients to undergo pancreas transplants at Upstate since Rainer Gruessner, MD, became chief of transplant services. Another patient, who nearly died after becoming addicted to an antidiarrheal drug, shares her story in an effort to help others. Upstate experts share information about the heroin epidemic, explain why athletes with concussions should not play, and tell about a hidden danger of meth labs. Doctors from the region’s only Level 1 trauma center explain what they have banned from their homes in an effort to keep their children safe. We’ve also got a look at the new pediatric emergency department and the way in which stroke experts from Upstate are extending their reach into more rural communities. And, page 15 provides especially useful information about caring for someone in mental decline. Kyle Reger of Cazenovia shares his story of recovering from a stroke in the summer 2016 issue of Upstate Health. He is featured on the cover, with one of his physicians, Shernaz Hurlong, DO. Also in this issue, learn about pancreas transplants that will be offered soon at Upstate University Hospital, and the specialized transgender medical care already available. You can also read the tale of how a poxvirus was discovered through the work of some diligent Upstate researchers. We’ve got stories about the medical Spanish class some students take, the recommended methods for surviving an ‘active shooter’ incident, how an Upstate researcher in Ecuador responded to the earthquake, and much more. The leisure section in this issue includes a look at paddle boarding and a woman who runs ultra marathons. There’s also a recipe for freekeh fruit salad. Welcome to the spring 2016 issue of Upstate Health magazine, with Mason Campbell on the cover. He’s an energetic toddler from Minoa. Read how he and his doctors are working to overcome spina bifida. This issue includes information about the the heroin epidemic, a salute to veterans who work at Upstate, and an expert analysis of the movie, “Concussion.” You’ll also read about a surgical technique that helps some trauma patients, a new method of preventing hospital-acquired infections and how better air quality can improve cognition. In the leisure section, read about a boot camp fitness class, and consider making protein pancakes with blueberry sauce, a recipe from a mother and daughter who call themselves The Clean Cooks. We hope you enjoy your Upstate Health. This issue of Upstate Health magazine showcases some of the exciting research into concussion detection taking place at Upstate. It also provides a peek into a couple of laboratories, one where neurodegenerative mysteries are being solved, and another that’s devoted to understanding how the brain develops. You’ll read about the return of the house call, by physicians from Upstate University Hospital’s emergency department, and about a “knife” doctors use to repair tumors without cutting. And, you’ll meet a doctor with a passion for music of all genres and hear from the women runners who won the J.P. Morgan Corporate Challenge race this summer. Learn about a simple way you can contribute to Alzheimer’s research that won’t cost any money. If you’re a health care provider, you’ll want to read about how celiac disease can mimic a brain tumor. And if you’re the curious type, you’ll want to read an explanation for why the cold weather makes our noses run. The magazine also features stories about Upstate people who give back — including eye doctors who provide care in Honduras, and other employees who turn run-down houses into low-cost homes. We hope you enjoy your Health, brought to you by Upstate. Readers will meet a nurse practitioner from Upstate University Hospital who spends his leisure time writing novels and a physician who is devoted to helping Nepal rebuild after the earthquake. They will also learn why so many people embark on weight loss surgery with a friend or family member. And, readers will get a close look at the rehabilitative team that helps patients put their lives back together after strokes and other brain injuries. Our experts explain when to worry about bladder cancer, why health care proxies are necessary and which exercises are best for bone health. We also spotlight in this issue a couple of new surgical techniques that give options to patients facing prostate surgery or salivary gland surgery, as well as important research that is changing the way ventilators are used for critically ill patients and premature babies. Enjoy Upstate Health magazine, brought to you by Upstate Medical University. Elizabeth Reddy, MD, is on the cover of the Spring 2015 Upstate Health magazine, related to a story about preventing the spread of HIV with a pill. In this issue, you will also learn about “the 7-minute workout,” why we never hear about cancer of the heart, and the difference between a primary and a comprehensive stroke center. You’ll meet a youngster who was able to hear sound, thanks to cochlear implants; a teen who returned to the sports he loves after brain surgery; and a physician with a personal story about health care proxies. Our scientists share their expertise on regenerative medicine, dengue fever and research into new drug targets for cancer. And, we take a look at Upstate people with a passion for dancing, and rowing. This issue of Upstate Health magazine features on the cover neurosurgeon Lawrence Chin, MD, and one of his patients, who agreed to share his story of recovering from a broken neck. You will also find stories about a new operating suite that allows for magnetic resonance imaging scans during surgery, and a new robotic tool that improves the precision of hip and knee surgeries. Our experts share information about epilepsy in older adults, how weight loss surgery affects the heart and research into childhood cancer. Also featured in this issue is the inspiring story of an outreach program that is helping to restore hearing in Ethiopia. Enjoy your Health, from Upstate. Welcome to the fall issue of Upstate Health, featuring a story on our cover about a young man who donated a healthy kidney to his father. Read about this son’s life-saving gesture, along with a variety of other stories having to do with healthy living in Central New York. You’ll find stories about the medical care we provide and the research in which we’re engaged. Some of our experts share their advice. You will also meet our students, some of whom traveled to other continents as volunteers and a pair who developed a case of puppy love as residents of downtown Syracuse. You will learn how Tony-winning actress Jessie Mueller got her start at Upstate, why nurse Sarah Martin loves kayaking, what author Walt Wasilewski learned while researching his book about spiritual care, and the question every doctor will ask himself or herself eventually. We hope you enjoy making Health part of your life. This issue contains information and inspiration. Read about the expansion of Upstate’s sleep center, the only one in this region with services that accommodate children as young as infants. Meet a former trauma patient who shares his ordeal, and his gratitude that Upstate has achieved national verification from the American College of Surgeons. Our pages give reason to cheer: for the courageous mother battling breast cancer; for the stroke survivor who is almost fully recovered, for the Special Olympian who loves floor hockey — and for four runners from Upstate who won the right to compete in the Corporate Challenge in London this year. You will also find important information from our experts about a dangerous drug that is hospitalizing and killing people in our community, advice on making a home “senior safe” and the latest news about the impact of coital lubricants on a couple’s chances of conception. Enjoy your Health, brought to you by Upstate! A physical therapist offers encouragement, along with her therapy session. A surgeon offers hope to a patient who wants to be able to walk. A professor offers enthusiasm for science. Upstate Medical University is academic medicine at its best. We care for patients with a range of health issues from routine to complex. We train tomorrow’s healthcare providers, and we conduct research that may lead to the cures of the future. This year as we celebrate 50 years (p. 17) our hospitals welcome a dynamic electronic medical records system called Epic that wasn’t even dreamed of 50 years ago. It will organize patient care documentation and allow patients access to much of their health information. Even as Epic illustrates technical advances, we are mindful to maintain the human touch (p. 14) and our important role in Central New York community. Need a referral or more information? Contact Upstate Connect at 315-464-8668 or 1-800-464-8668, day or night, for appointments or referrals to the health care providers on these pages or anywhere at Upstate — or for questions on any health topic. In recent months the Syracuse skyline has seen a dominant new structure rising. Hundreds of construction workers have played integral roles in creating the new home for the only place in Central New York that provides cancer care for people of all ages. The Upstate Cancer Center is scheduled to be ready for patients next year. Syracuse has also gained new laboratory and workspace for scientists and entrepreneurs in the opening of Upstate’s Neurosciences Research Building and the Central New York Biotech Accelerator. These projects and others represent nearly $1 billion in new construction, providing modern new space for patient care, research and ongoing education, the core components of Upstate’s mission. On these pages you’ll find coverage of that mission in stories about advanced medical care for stroke, concussion and trigeminal neuralgia. You’ll find a very personal story about a prominent surgeon, incoming Onondaga County Medical Society president, Dr. David Halleran, MD whose family has a strong history of pancreatic cancer. You will also read about an innovative way doctors are learning communication skills, the advice one mother offers about parenting when you have cancer, and a dietitian’s explanation of the benefits of fiber. From the research realm are stories about studies involving Upstate professionals on post-traumatic stress disorder, improving immunization rates, the ill effects of party drugs, the value of social workers and understanding schizophrenia. We share stories about a medical mission to Ghana, and passions for soccer, car racing and reading in our leisure section. As a reminder that laughter is the best medicine, don’t forget The Humorist, Jeff Kramer, who recently spent some time as a patient in the emergency department of Upstate University Hospital. Mother/daughter nurses are on the cover of this issue of Upstate Health. Read how heart surgery as a child inspired Megan Havener, RN into a career in nursing. She and her mother both work at Upstate. We’ve got a couple of other stories in our Patient’s First section — one about a student who became a stroke patient, and another about a brain tumor patient who became a student, and then an employee. If ever you have wondered, “what is Upstate?” our collection of nostalgia starting on page 11 will go a long way toward answering that question. The academic medical center in Syracuse has a rich and interesting history that continues to influence our mission today. We train doctors and nurses and other health professionals, and we also provide vital medical care and conduct a variety of research endeavors. Our campus houses some of the most respected experts in the Central New York region – and starting with this issue, Upstate Health is tapping their knowledge to answer your questions. We aren’t giving personal medical advice. For that, you’ll need an appointment. (Call 1-800-464-8668 for referrals.) Instead, our health care providers and scientists will field general questions, such as those on page 16: Does blood type change after a stem cell transplant? Between issues of “Upstate Health,” stay in touch with us on Facebook or by subscribing to the “What’s Up at Upstate” blog at www.upstate.edu/whatsup You can also tune in to “HealthLink on Air,” Upstate’s weekly radio talk show, from 9 to 10 p.m. Sundays on WRVO Public Media, part of National Public Radio. Enjoy your Health, brought to you by Upstate. Olamide Ajagbe MD took a quick break from her shift at Upstate Golisano After Hours Care, at Upstate’s Community Campus, to be photographed for this issue of Upstate Health. You’ll find a story about this service that began in 2012, providing care for pediatric patients up to age 21. Also in this issue you’ll notice several articles marked with radio microphones. For these subjects (and many others) you can listen to a complete interview on line at www.upstate.edu/healthlinkonair. We’ve got stories about “Wizard of Oz” author L. Frank Baum, the new Impella heart pump that helps high-risk patients, a teenager who is grateful for the stem cell transplant he underwent as a preschooler, and a respiratory therapy student who is into scuba diving. You’ll also get to meet Mark Torres, a hospital systems engineer, Juntao Luo PhD, a cancer researcher, and Thomas Kiernan, the top chef at University Hospital. Emergency physician Jeremy Joslin MD is featured on the cover of the Fall 2012 issue of Upstate Health, in front of the EMS & Disaster Medicine Physician Response Teams’ white Ford Expedition. The issue includes an amazing story of stroke survival, five inspiring kidney donations and a look at the dangers of distracted driving. There is also a story that tells you everything you need to know about hepatitis C, and another that explains when (and when not) to have a medical scan. Should research include people with developmental disabilities? That’s the question addressed in “The Upstate Ethicist” feature. Have you read Dr. Abraham Verghese’s “Cutting for Stone?” That’s the book recommended in the “Good Read” feature. You’ll meet clinical toxicologist Alexander Garrard on page 16, respiratory therapist Kristina Sherman on page 19, eight Upstate triathletes on pages 20 and 21, and executive sous chef Bill Gokey on page 17 — along with his Strawberry, Chicken and Fennel Salad. Our back page is a showcase for work from the lab f Jeffrey Amack PhD and graduate student Yongchang Ji. And don’t forget to check out the cover story, on page 15, about Joslin and the other Upstate physicians who respond to disasters throughout the community. Psychologist Dr. Rich O’Neill PhD has the cover for Spring 2012. A bicycle enthusiast, he pedals to work, including to the Health Link on Air studio every week where he records “Check Up from the Neck Up.” Upstate’s talk radio show airs from 9 to 10 a.m. Sundays on WSYR. This issue includes information about pediatric sleep disorders, a radioembolization procedure that targets liver tumors, and stroke care at Upstate University Hospital. You’ll read about a study of hand hygiene among Adirondack hikers, a do-it-yourself thyroid check and why removing polyps can reduce the number of cancer deaths. Meet a carpenter who turned a black walnut tree into a commemorative table, an information technologist known as the “Restore King” of Upstate, three faculty members who are avid bicyclists, and a man who fishes four times a week, year round. We also explain how (and why) to make an anatomical gift to the medical school and provide a look under the microscope of Peter Calvert PhD. Father/son cancer specialists are featured on the Winter 2012 cover. That’s Michael Poiesz MD with his father, Bernie Poiesz MD and their Irish setters, Beacon and Finnegan. Read how they strike a work/life balance on page 14. In this issue, look for stories about a construction engineer who has a loved one on his mind as he works on the new Upstate Cancer Center, a teenager treated for a rare brain tumor, and a new method of caring for severe frostbite. Kaushal Nanavati MD walks us through five strategies for treating headaches. Trauma coordinator Steve Adkisson provides a simple visualization to help prevent injuries. James Alexander MD explains what to do about heavy menstruation. A speech language pathologist, clinical dietitian and speech therapist team up to provide advice on feeding someone with a swallowing difficulty. Two bariatric surgeons lay out the options for weight loss surgery. And a pediatrician tells how adolescents are like astronauts. You’ll meet a man who runs ultramarathons, a woman who is a 3rd-degree black belt in karate, a contracts administrator who loves reading the classics and a man who skis all winter with his family. On the back page, you’ll get a peek into the laboratory of Mira Krendel PhD, an assistant professor of Cell and Developmental Biology. The cover of the inaugural issue of Upstate Health features Zulma Tovar-Spinoza MD with one of her patients, Lily Craparo. Their story begins on page 4. There are additional stories about narcissism (the official diagnosis of which is fading,) wound care (which is of great importance to those with diabetes) and how to bathe an elderly loved one. You’ll also get an up-close look at the da Vinci surgical robot, learn about a germ-free alternative to hand shakes and discover the musical gifts shared by many medical students. Upstate’s Department of Pediatrics chairman shares three great hikes, and Christopher Turner PhD and Nicholas Deakin PhD share a view from their laboratory, where they study how cancer spreads.